GO CO-OP IN OCTOBER: Get Ready for Co-op Month! Get ready, Co-operators: Co-op Month launches later this week on the first day of October! Every October, co-operatives and their members across the country celebrate Co-op Month. 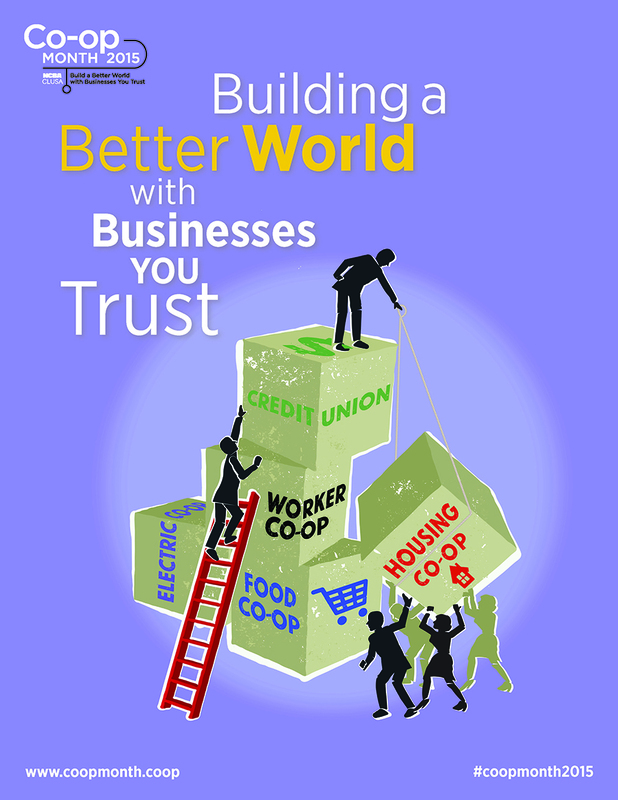 The theme identified by the National Co-operative Business Association (NCBA) for 2015 is “Building a Better World with Businesses You Trust.” This basic message is reminder of the many ways that co-ops enable people to work together to build businesses that are rooted in and accountable to their communities. The “Go Co-op” logo incorporates the Co-op Marque developed by the International Co-operative Alliance to help co-ops around the world increase awareness, promote the Co-operative Identity, and differentiate co-ops from other business models. The NFCA’s initiative recently received international recognition from Domains.coop for our efforts to educate shoppers about the wider co-operative economy. By promoting our common co-operative identity, our co-ops are demonstrating our shared impact in building a more just, sustainable and participatory food system and economy. Dairy farmer John Haynes, one of eight siblings, is the only sibling who stayed on the farm with his father. John claims that he has spent “half of his lifetime” clearing their pasture because his father was so committed to pasture grazing. John hasn’t plowed his fields in 30 years, and uses rotational grazing to keep his fields healthy, adding in fertilizer from his cows. Haynes Dairy is just one of the 170 member farms of the Organic Valley co-op in New England that supply milk and dairy products to food co-ops across the region. Neighboring Food Co-op Association (NFCA) worked with Organic Valley staff to organize the third Organic Valley Farm Tour for NFCA member food co-ops. This tour offered 30 food co-op staff from 14 food co-ops across New England to learn more about organic dairy farming, build relationships with farmer members and food co-ops in the region, and enjoy a great day on the farm. John and Beth Haynes have owned Haynes Dairy since 1991, when they purchased their 130-acre farm from John’s parents. On the tour, John described his milking process for their 63 cows, and explained how much he appreciates Organic Valley’s “win-win” of paying premiums for healthy milk. To keep his herd healthy, he focuses on preventative health, giving them calcium, probiotics, and vitamins. He also takes pride in having a happy herd of cows. “When we milk cows for the first couple times, we have two people on the job: one to milk them, and one to rub their backs and help them feel comfortable and relaxed.” John said being a farmer-owner of Organic Valley allows him to work on having healthy, happy cows instead of being forced to push his herd for high production. The cows on Haynes Farm are quite the characters: they have a “pecking order” with leaders, and certain cows, such as a brown cow, Ember, are natural leaders of the herd. They also know their milking stalls and will nudge other cows away from their stalls when they head into the milking parlor. As John opens the fence to a fresh section of pasture, the cows rush to graze on the tall, lush mix of native grasses and clover, and staff from food co-ops across New England stand feet away from the rush to fresh pastures, reaching out to greet them and snapping photos to bring back and share with their co-ops and communities. The tour of Haynes Farm was organized by Organic Valley in collaboration with the Neighboring Food Co-op Association (NFCA), a network of more than 30 food co-ops and start-up co-op initiatives, as part of their work of creating a thriving regional economy, rooted in a healthy, just and sustainable food system and collaboration among co-ops. *Feel free to use this article and reprint it in your co-op’s newsletter, e-news or website. Please include the credit information at the end of the article. Next year, the Middlebury Natural Foods Co-op will celebrate its 40th birthday. The co-op, a member of the Neighboring Food Co-op Association (NFCA), has a lot to celebrate, including 4,200 member-owners, accomplishing four successful expansions in less than four decades, and being recognized nationally as a leader in the local foods movement (the co-op currently does business with 270 separate food producers, and counting). On September 17, the Addison Independent covered the co-op’s progress and plans for the future. One example is the work the Middlebury Natural Foods Co-op is doing with the Neighboring Food Co-op Association and other neighboring food co-ops to make healthy food and co-op ownership more accessible to all. “‘Providing healthy foods for everyone in our community while keeping prices down and remaining central to the strength of our local food system, has never been more important, even as our commitment to things like environmental best practice and remaining downtown raises the bar,’” said MNFC Board President Tam Stewart. Have you noticed the “Cave to Co-op” signs in the cheese section of your neighboring food co-op? Septembers’ “Cave to Co-op” special artisan cheese is “Reading” from Spring Brook Farm in Reading, VT.
All funds from the sale of Spring Brook Farm cheese go to support the Farms For City Kids Foundation. You may have seen references to “COOL” in the news or in social media lately, perhaps alongside a photo of cellophane-wrapped meat at a grocery store. What exactly is COOL, besides a way to beat the heat? And why should you care about it? Well, as with many agricultural policy issues, this one isn’t simple, but Country-of-Origin Labeling (COOL) does make a big difference to farmers and consumers alike. Recent movement toward voluntary labeling seems to be the way forward. Overview: In 2002 and 2008, Congress passed mandatory Country-of-Origin Labeling (COOL), a popular labeling law that says muscle cuts of meat, and fruits and vegetables, must be labeled with the country’s name where they were produced. Mexico and Canada subsequently filed claims at the World Trade Organization (WTO) charging that COOL was causing a decrease in volume of their livestock exports to the U.S. The WTO has repeatedly taken issue with the way COOL has been implemented, and arbitration is currently underway. While National Farmers Union (NFU) remains steadfast in its support of COOL, Congress is likely to take action prior to the conclusion of arbitration. Responding to the threat of retaliatory tariffs, the U.S. House of Representatives recently voted to repeal COOL, and the issue is now before the Senate. Canada and Mexico Win: Canada and Mexico have made clear that a voluntary labeling system in the U.S. would be a working solution. U.S. Consumers Win: The new voluntary system maintains integrity of the ‘Made in the USA’ brand and will prevent meat packers from deliberately deceiving consumers as they have in the past. A decade’s worth of polling shows unequivocal strong support among consumers for food labeling.